If you have any information about the event that took place on the night of 2 June, at Yüksel Street Kızılay, in order to find the witnesses to make depositions in court, please reach us at 505 634 5765 . The interview below may be shared on your social networks. I am the second daughter of a family that is proud to never use any physical force during the upbringing of their children and lately I’ve become aware that this is not matter of luck but a right. For someone who was never experienced or even closely witnessed any acts of violence, it was really difficult to imaginehow people could be attacked so severely for any reason and tremble, crouching on the ground protecting her legs due to deadly blows she received. You can emphatize with or even internalize the suffering of others but still you cannot easily comprehend the idea of yourself being in that situation. This was exactly the case for me until the night of 2 June 2013. Until 2 June, the day you experienced the violence yourself, what kind of events had you witnessed? I was out on the streets since 31 May, the day when my generation suddenly shrugged off their apathy and hopelessness. I was trying to photograph the events. What struck me most was the things that happened around a young man who was shot in the head by a gas cartridge on Yüksel Street. There were around a hundred protestors and about twenty police officers near him. While a couple of medical doctors were trying to attend to that man, the police fired a gas bomb aiming at a nearby spot. The protestors there were not vandals. However if the police hadn’t run away they might even have attempted to kill them. Would the doctors or people leave the injured and save themselves? No, surely they would try to fend off the ones firing gas. If that’s by way of throwing stones that would still be legitimate and this would still be a passive act. Because that would only be self-defence. During the protests the solidarity spirit has strongly manifested itself. 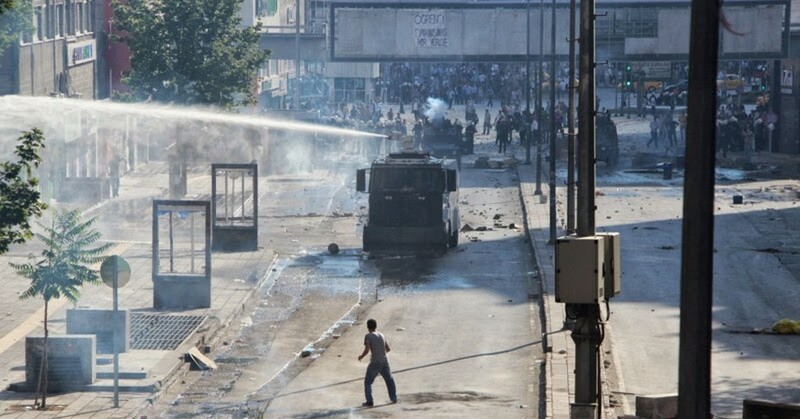 How do you describe the solidarity atmosphere in Ankara? There was cooperation, kindness, affection on the streets; things we haven’t witnessed before. We were happy although it was impossible to breath and to look around because of the gas firing and people were getting injured all the time. We were feeling down but where there’s hope one cannot avoid happiness. On every corner we had comrades waiting to attend to us with lemons, antiacid, milk, Doctors attended the injured immediately and those brave ones who were hit by the fired cartridges and killed by them. Young men coming from the outskirts of the town were cheerfully talking to young women studying at universities. Even those who didn’t really know what was happening or apolitical ones could sense that certain things were getting better. Anyone who wasaround Kızılay on the first days of the events wouldn’t deny a sense of a utopian experience. Which of the groups were you with? I was riding my bike and sharing the milk, photographing the injured and helping the elderly people in tears. I was casually chatting with people whom I didn’t know but noone seemed to find it odd at all. We weren’t used to this. We were raised being selfish and our lives were built upon motivations of “I want” or “that’s mine”. But when we got to 2 June, nobody was scared of tear gas as we all learned that we could withstand its effects and thanks to the solidarity environment we realized that we had many things that we could sacrifice . What happened on 2 June evening? I had some money and I didn’t want to take the free food being offered thinking there might be others in need. I decided to go to Tombiş at Yüksel Street. After fifteen minutes the place was full of tear gas. There were nine or ten people inside, an old man was having his dinner. When around 10 riot police entered the place we were still under tear gas. The police yelled at us saying that we had to evacuate the shop. Even those who didn’t plan to resist didn’t want to react or move as they were aware that they had the right to eat anywhere they like. Then the police officer swinging his baton randomly shouted at us to leave. One of the clients said that he had the right to eat there and was taken outside by being beaten and pushed. At that moment everybody realized the seriousness of the case and I got up to quickly leave. One of the police officers said, “Ooo! She is wearing a hard hat as well!” and started to hit me on my legs and back with his baton. One of the people there said, “Don’t hit the girl,” and he became the new target. The last time I saw him, he was curled up trying to protect his head. Why do you think that they’ve targeted you amongst a group of people? I think it was just beacuse I was wearing a cycle helmet. The bloody hands of fascism can always produce its own reasons. They let everyone else leave but me. Suddenly four police officers satrted to beat me up; some very harshly others relatively less. They were aiming at my back, arms, legs while at the same time telling me to leave the shop. However, as they were continuously hitting me, I coudn’t move for crying. I was begging them to stop saying, “I didn’t do anything.” After this I realized that this was all happening since people “didn’t do anything,” and didn’t stand against violence until now. Then I took advantage of a momentary pause in the beating and tried to hide by crawling under the tables in the next room. Before I could pull my legs in one police officer caught me by my legs, pulled me out and told me to get up. When I stood up he hit me across my face, my lip and inner cheek was slit open. I felt dizzy and noticed that blood was running down my face. I was thinking about letting myself fall down but I was scared of being beaten and kicked more harshly. How did they stop beating you? I was being beaten for about twenty minutes and they were going to go on hitting as long as I was standing there. So I let myself drop down and my body started trembling due to the shock. Then one of the police officers, who was a bit more kindly, I believe, suggested they detain me while searching my bag. I was relieved to hear that; so they wouldn’t kill me! When you’re among men beating you up with batons, the fear of death overwhelms your mind and body. Later on could you ever make sense of the assault by the police just because you were wearing a helmet? How did you get out of there finally? Were you detained? I was detained and taken for a medical examination. However my bruises were not obvious enough yet. Three days later when the bruises became more distinct I went to Gazi Hospital to get another health certificate. At the police station, they wanted to me to sign a paper saying that I’m a suspect of terrorist activities as I happened to be at the Gezi Park protests. I did not agree to sign it. When I was beaten up and detained, I was neither on the streets nor among the protestors. I was at a cafe, having a snack. Even such a simple liberty is up to the desicions of others. Did they force you to sign that paper? As I was in a quite bad condition they left me alone. However they were pushing others to quickly read and sign the papers by saying, “There are many people waiting outside, be quick what’s there to read for so long”. But as they left me alone I could read it all and decided not to sign it. Then they said, “If you sign that now you can leave immediately, or else you will have to wait for your lawyer until tomorrow morning.” I answered, “That’s ok, I’ll wait.” In the end they told me to write ‘“I refrained from signing,’ sign and leave,” so I did that. Looking at my face, with bruises and all, even the police at the station were asking, “What happened to you?” and didn’t want to believe that it was the riot police who did that. They were asking,“Why would they do that to you?” I guess I didn’t have the look of a protestor so it wasn’t easy for them to get it. But that was the situation in this process; there wasn’t a difference any more between the ordinary person and an organized rioter. Being a naive and nice woman doesn’t mean you won’t have your share of such violence. What sort of a legal procees have you initiated? When I told my story to Kuğulu Park Initiative, they said that most evenings lawyers from the Ankara Bar Association were visiting the park. One evening when there was a lawyer there they let me know and we prepared a complaint statement together.The day following the incident, when I went to the cafe in order to ask for the camera recordings, they told me that the police took the recordings via a prosecutor’s decree and they wanted to stay out of this case. However, everybody told me that it wasn’t possible for the prosecutor’s decree to come out in one day. So either the cafe staff was lying to me or the police went there without any permission and got the material. I have medical reports of the results of the beatings but as I don’t have any images, I need the witness statements of two people I had a chat with that day in order to strengthen my claim. I hope they will reach me in some ways. Have you started to receive any psychological support following the events? Of course this event had a very strong effect, enough to require psychological help, but perhaps because I’m kind of an introverted person I didn’t want to ask for help. I don’t enjoy talking about the violence I was subjected to. Perhaps I prefer trying to forget and avoiding it. On the other hand it makes me feel better to write down my feelings or give this interview. Even hearing people making sounds by banging on pans and pots gives me a sense of confidence. Many forums, meetings taking place at various parks show me that I didn’t endure that assault for nothing. Recovering from our injuries may take many years. 31 May was a drop of water in the ocean, but then again, an ocean is made up of water drops. 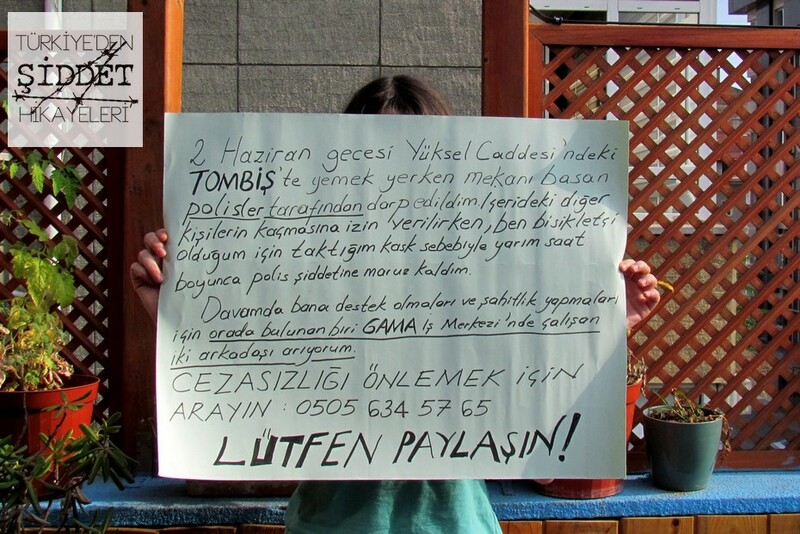 This entry was posted in Accounts of violence, Interviews, News, Personal stories and tagged Gezi Park, Gezi Resistance, Police brutality on 27 July 2013 .